Credit Union to host complimentary financial seminar and feature special share certificate offer during Military Saves Week. Andrews Federal’s Jim Hayes, Oma George, and Rosalind Bishop shown here with Brig Gen (Sel) Teichert and Capt. Robert Coogan. Andrews Federal Credit Union is once again a proud partner of the Military Saves Campaign. This year, the Credit Union’s Jim Hayes, President & CEO, Oma George, Chief Retail Officer, and Rosalind Bishop, Regional Manager, kicked things off by attending the Military Saves Week Proclamation Signing at the Military and Family Support Center on Joint Base Andrews. Military Saves Week (February 26 – March 3) is an annual opportunity for installations and organizations to promote good savings behavior, as well as a chance for service members and their families to assess their own saving status. Typically hundreds of organizations participate in the week, reaching millions of people. 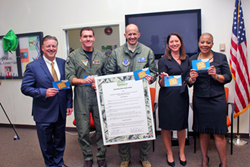 During the Proclamation Signing, Andrews Federal donated a $100 gift card for the winning squadron who commits to saving the most during Military Saves Week by signing the Military Saves Pledge. The Credit Union will also feature a Special Generator Share Certificate Offer to help kick start a savings plan. The certificate offers a 0.75% APY for 36 months, and will match the first $50 towards opening one. Additionally, a no-cost financial seminar entitled “Saving to Achieve Your Goals,” presented Kerry Robinson, Partner Development Representative and The Veterans Community Engagement Liaison for GreenPath Financial Wellness, will be held at the Credit Union’s Headquarters in Maryland on March 1.